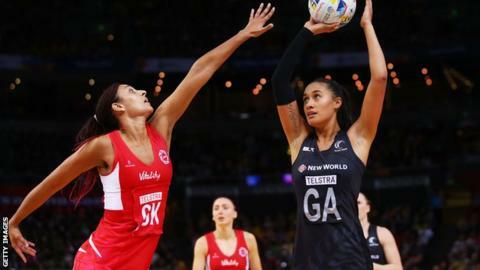 England missed out on a place in the Netball World Cup final after losing 50-39 to New Zealand in Sydney. The Roses went into Saturday's semi-final with only one defeat from six matches in the group stages. But unbeaten New Zealand turned over England's first centre and they never relinquished their lead. England will now play Jamaica in the bronze medal match on Sunday (04:10 BST), while the Silver Ferns meet holders Australia in the final. World and Commonwealth champions Australia booked their place with a hard-fought 67-56 victory over Jamaica in the second semi at the Olympic Park. It means the world's four highest-ranked sides are guaranteed a top-four finish at a World Cup for a fifth consecutive tournament. As Australia and New Zealand prepare to contest yet another final, maybe the true measure of England's success will come on Sunday. Should the Roses lose to Jamaica, in an echo of the 2014 Commonwealth Games, then that will be a dent in the momentum new interim coach Tracey Neville has built. Win a bronze, then there's four years to get it right before the next World Cup lands on England's shores. New Zealand beat Australia during the qualification group last week but history is on the side of the hosts, who have won 10 titles compared to the four of their Antipodean rivals. England, ranked third in the world, beat Jamaica to the bronze medal at the 2011 World Cup in Singapore but the Sunshine Girls came out on top in the third-place play-off at last summer's Commonwealth Games. England found themselves 4-0 down early on in the semi-final, but rallied to keep the deficit to only four at half-time. New Zealand pulled ahead to make it 37-27 with 15 minutes to go and England could not recover. The world number two Silver Ferns will now aim to win their first world title since 2003. "We punished ourselves," said England coach Tracey Neville, who has been in charge since March. She told BBC Sport: "There were times in the game where I had to make changes because of the effect New Zealand were having on us. "To come into a World Cup without a four-year build-up is hard. These players have backed me all the way but obviously there are some misunderstandings, and coming into a pressured situation, that's where you fall down." Wales were beaten 71-52 by fifth seed Malawi, as Scotland fell to an agonising 57-56 defeat by Trinidad and Tobago in the placing matches. It means Wales will now play-off for seventh place against Uganda on Sunday, while the Thistles will compete for 11th spot against Fiji. In the other placing matches, Malawi will play South Africa, Trinidad and Tobago face Samoa, Zambia take on Barbados and Sri Lanka play Singapore.